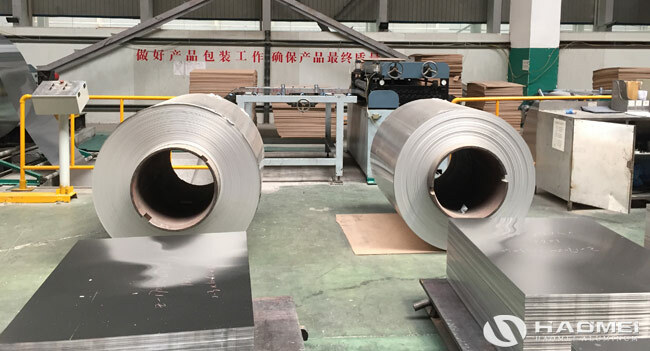 Aluminum coil, also named as aluminum roll, according to the method of producing process treatment, it can be divided into two type, hot rolled aluminum coil and cold rolled aluminum coil. When it comes to how to make sure the product type we need, the difference of hot rolled aluminum coil and cold rolled aluminum coil should be get. The difference between the hot rolling aluminum coil and cold rolling aluminum coil: First compared from aluminum coil production process, after the aluminum ingot melt, coupled with the metallic elements, heating 12-15 hours, again flue into the crystallization pool extract impurities, after cooling, peel the top layer of impurities. For heating oven heat preservation, the temperature should be controlled between 450-520 degrees, heat preservation for 12 to 15 hours, and then flue into the crystallization in the pool, here is the different beginning of hot rolled and cold rolled aluminum coil, the hot rolling aluminum coil is pressure rolling by mill above the heat preservation temperature, and the cold rolling aluminum coil is pressure rolling by mill below heat preservation temperature. Hot rolling and cold rolling have advantages and disadvantages each at the same time. The cold rolled mainly treat the plate with can not be heat strengthen, the general requirements for surface is higher, and foil, and ultra-thin material also can only use cold rolling mill. Relatively hot rolling offers cold rolled billet firstly, then a lot of material need high corrosion resistance, fatigue resistance, high plasticity, etc, all these needs to be hot rolled.